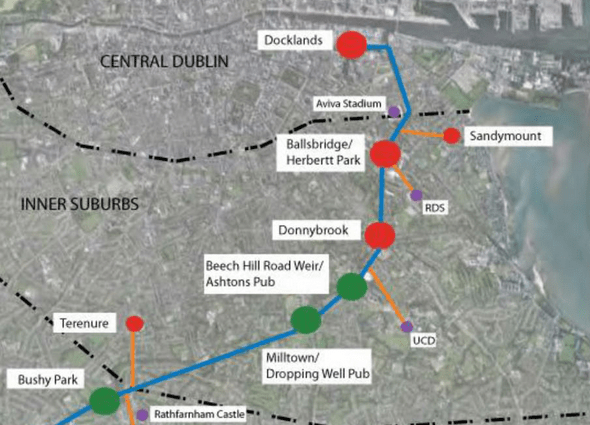 Designs for the Dodder Greenway between the Docklands and Miltown are expected to be ready by August 2015. In a memo to Dublin City councillors, the transport section of the council said that a tender is soon to be issued to hire an engineering consultant firm to design the section which covers the Dublin City and Dun Laoghaire Rathdown areas of the route. Another design team is to work on the South Dublin County Council section of the route. Manzira said that the route should “aspire to be on a par with the best in Europe and should include ancillary features for tourists and amenity users”, however Danish consultants hired by the National Transport Authority disagree with the current planned approach of largely mixing walking and cycling on the route. In September, we reported how the head of the Copenhagenize Design Company said that the route should be a “bicycle superhighway”, with footpath and cycle path segregated for each other. Those comments were made to IrishCycle.com after the Dodder Feasibility Study Report was released as part of the environmental and ecological assessment tender. The council memo this week said that the overall project requires a single environmental and ecological assessment and that the consultant firm has been appointed to carry out an assessment on behalf of the three local authorities — Dublin City, Dun Laoghaire Rathdown, and South Dublin. Two engineering consultancy teams are to be appointed to carry out the design of the schemes, including the statutory planning process. I seem to remember seeing seven different environmental approval processes listed that have to be cleared before work can begin. Any bets on when it will start on site or more importantly when it will be fully completed? If this route is intended to be used by commuting cyclists, or indeed for anything other than just recreation, shared use is absolutely *not suitable*. There will be many users, with differing needs, going different directions and by different modes. The route links many residential and employment areas as well as recreational ones. If it goes ahead as shared use now, it will need to be redesigned at some point in the future, at great expense. “Cyclists are still likely to be regarded as a problem because their behaviour is different to that of pedestrians. Cyclists appear to invade personal space around pedestrians, to “squeeze past”, to wobble and to swerve in and out. Even when taking care, their behaviour seems aggressive and unpredictable to many pedestrians. Complaints about excessive speed of cyclists on shared paths are often a result of perception by pedestrians rather than being due to cyclists riding past pedestrians at genuinely high speeds.